Hippo Campus is an indie-rock band from St. Paul, Minnesota. The five members and lyricists are Jake Luppen (lead singer), Nathan Stocker (guitar), Zach Sutton (bass), Whistler Allen (drums), and DeCarlo Jackson (trumpet). The five have released four Eps: "Tarzan Reject" (2013), "Bashful Creatures" (2014), "South" (2015), and "Warm Glow" (2017). 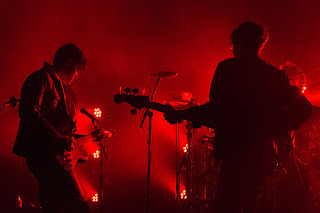 Hippo Campus released their first full-length album "Landmark" in 2017; they also released a second album "Bambi" in October 2018. Hippo Campus gained recognition locally, initially getting featured on a couple of Minnesota radio stations and playing at house parties. From there, they grew, gaining an international following and going on two international tours. The "Landmark" tour concluded in early 2018 and the "Bambi" tour began on November tenth and is set to go until March 2019. Hippo Campus' lyrics set them apart from other artists. Though, instrumentally, their songs sound quite nice (though similar to much of the other indie-rock/ alternative bands out out there) poetic, yet personal and reality-based lyrics make Hippo Campus an unusual twist on the typical 'indie boy-band' trope. As a brief intro to the band Hippo Campus, Ones To Watch lays out a summary of when Hippo Campus has released both of their Eps: "Bashful Creatures" and "South", as well as their debut album, "Landmark". Following the initial success of Hippo Campus' Eps, Ones to Watch documents the main venues Hippo Campus has played at, as well as the major radio stations Hippo Campus has been featured on. Grimy Goods interviews Hippo Campus about the lyrical content of their debut album "Landmark", primarily focusing on the social commentary made in some of the songs (Western Kids, especially) about the affects of social media on younger generations. The Student Playlist outlines the progression in lyricism and sound from Hippo Campus' Eps, which were first released in 20014 and 20015, and Hippo Campus' first full-length album "Landmark". It also gives a review of the album in relation to other indie-rock/ alternative music that would be categorized as similar to "Landmark".